This release represents an important first full-length CD of the work of the highly acclaimed young composer David Sawer. Having studied with Mauricio Kagel and been the recipient of numerous awards and scholarships, Sawer has consistently responded to a string of major commissions since the 1990s. 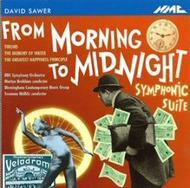 The disc includes a specially constructed orchestral suite based on From Morning to Midnight, the full-length work commissioned by English National Opera, premi�red at the London Coliseum in 2001, for which he subsequently received a Laurence Olivier Award nomination for Outstanding Achievement in Opera.